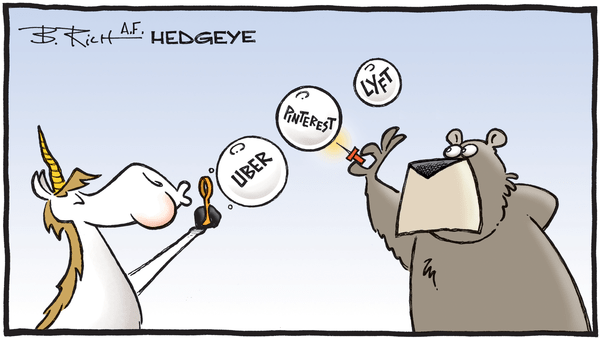 Takeaway: Please join us for a review of the Pinterest (PINS) IPO on 4/15/2019 at 12:30 PM ET. Pinterest (PINS) kicked off their IPO roadshow on Monday after filing an amended S-1 that set a price range of $15 - $17/share. The $16/share mid-point implies an enterprise value of ~$10.5 billion and PINS is expected to begin trading on the NYSE next week. The valuation is likely to the disappointment of late-stage, private investors who bought in at $12 billion in 2017. However, we believe it is a better decision to err on the side of conservatism, especially given the negative sentiment surrounding the Lyft (LYFT) IPO. Still, even at $10.5 billion, PINS would trade at a generous TTM and NTM EV/Sales multiple of 14x and 9x, respectively. There is a lot we like about the company and its fundamentals. We like that PINS is in the very early stages of monetizing their 265 million MAUs (184M Intl / 82M U.S.), especially in international markets where ARPU averaged a paltry $0.06 per quarter in 2018. We like that PINS value proposition to advertisers is based on conversion over reach, with more than 50% of users coming to the platform with the intent to find or shop for products. Our preliminary checks with agencies and CPG companies have come back mostly positive and in support of the ROI narrative and increased ad-spend on both a net new and same-store basis. That said, we still have more work to do on the international side. From a user perspective, such high commercial intent means that ads are a natural part of the user experience, unlike social media platforms where ads are incidental. Meanwhile, management has avoided the 'growth at all cost' mentality in favor of a more disciplined and measured approach, a style better suited for a public company in our opinion. This difference in philosophy has manifested itself in part through improved profitability and scale, with the company on track to achieve full-year adjusted EBITDA profitability in 2019, based on our model. Overall, we like the PINS story at $15 - $17/share and will look to get more aggressive on the long side if it breaks. We will run through the model, end-market, competitive landscape, the data we are tracking, valuation framework and more on the call.